sent me a crate of hand soap as a thank you. TD introduced me to it decades ago. He swears by it. I totally understand why because this stuff works. Coming from a garage mechanic's standpoint he says nothing gets automotive grime off hands better than Boraxo. I view it from a gardener's viewpoint and say the exact same thing: Nothing beats it either...pardon the grammar. 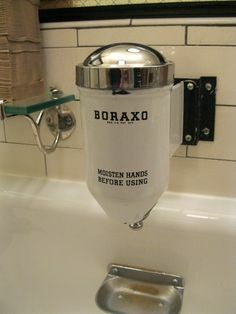 Remember these old vintage Borax dispensers in the bathrooms? I'd love to have one in my laundry room. Instead, I have the little cardboard canister. It's a staple at the clean-up sink. As cardboard shaker cans became available for public purchase, the company made the canister with a heavy coated wax overlay so that wet hands wouldn't sog down the cardboard. Genious. These coated cardboard cans are still available today but sometimes a little hard to find. Easier to procure are the large boxes, thus my wish to find a vintage canister to hang on the wall by the sink! The shaker cans are much better to use than grabbing the large box because of the special outer wax coating. The big boxes don't have it and break down faster with wet hands. I'm going to presume anyone who gets their hands dirty already knows about this product but in the off chance I reach just one person and make them a believer I will be happy. One of the best sites for information on Boraxo comes from a Blog (no kidding!) Written by a man known only as "Kevin," it is entertaining as well as informative. I've attempted to grab pieces and post directly below for those too lazy to visit Kevin's site. The company began with Francis Marion Smith who established the first successful borax mining operation in 1872 at Teel's Marsh, Nevada. At the age of 21, Francis left Wisconsin for the West to prospect for minerals. He staked his claim with his brother Julius to a borax mine at the edge of a marsh. The borax works separated impurities from the borax crystals. 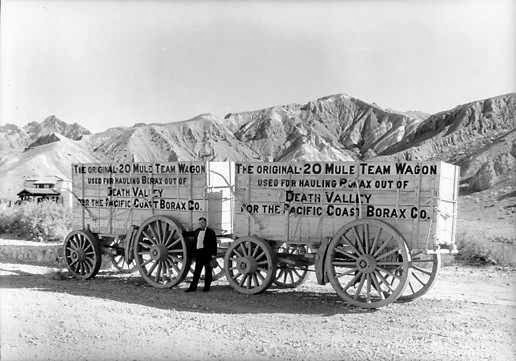 The brothers shipped their product by mule train, the origin of the now famous 20 mule team that is the symbol of Boraxo and other Borax-based products to this day. One of the routes led them across the Mojave Desert through what is now known as Death Valley. 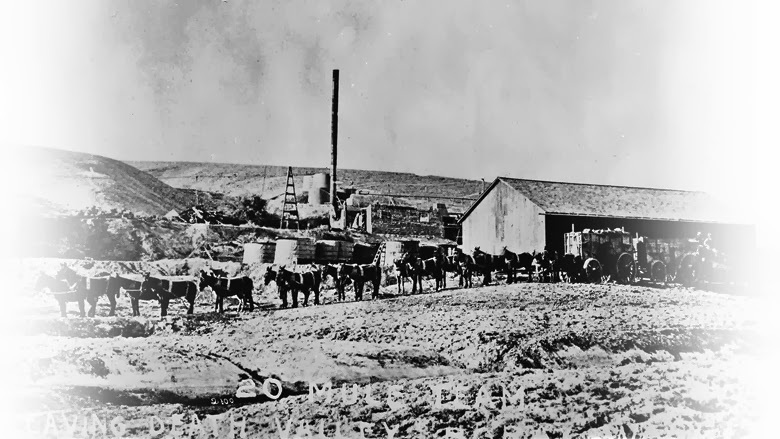 Francis worked several other borax operations, hauling the mineral by mule train until it was possible to transport by train. Today, the Borax company and Boraxo powdered hand soap are owned by Dial. 20 Mule Team Ready to Go! It is made from all natural ingredients that will not pollute the environment. Boraxo is a fantastic skin exfoliate. It's affordable and leaves your skin feeling great - and yes, even your face will love it. Grease and grime is a real problem for regular hand soaps, but Boraxo scrubs your hands clean and carries away all of that grit and grime. It's not often that you get a chance to use a product that has changed little in over 100 years. There really isn't anything quite like Boraxo soap on the market today. While it can be a little difficult to find in the store, it is well worth ordering online. Boraxo rocks. Go get some. Thanks, your site is great too - and I love the products! I sent it to a friend of mine who has grandchildren with skin allergies.